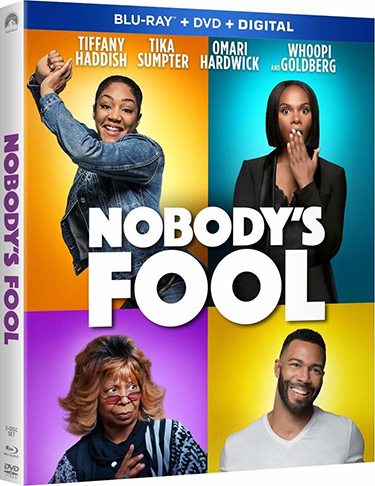 “Tiffany Haddish is a riot” (Russ Simmons, Fox Kansas City) in Tyler Perry’s NOBODY’S FOOL, arriving on Digital January 29, 2019 and on Blu-ray Combo Pack and DVD February 12 from Paramount Home Media Distribution. The Digital and Blu-ray Combo Pack releases are loaded with more than an hour of wildly funny bonus material including an outrageous gag reel, over 20 minutes of deleted, extended and alternate scenes not seen in theaters, a special introduction by Tyler Perry and Tiffany Haddish, and nine hilarious featurettes. § “Something New From Tyler Perry” Perfume – Watch this side-splittingly funny faux commercial for Tyler Perry’s Nobody’s Fool. § “Catfished” Perfume with Outtakes – Enjoy this hysterical fake commercial for Tyler Perry’s Nobody’s Fool with Tiffany Haddish.